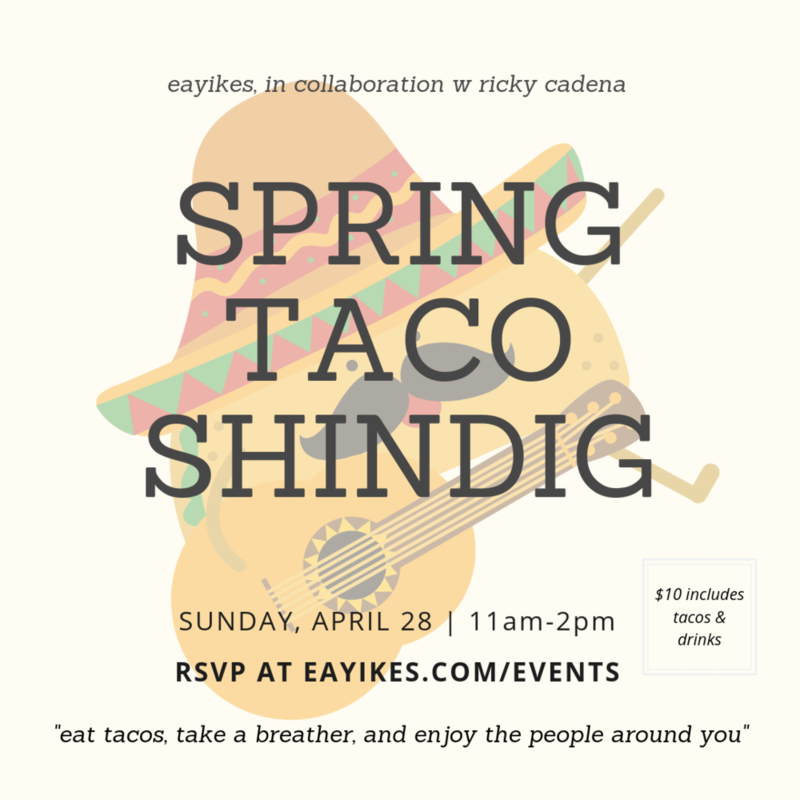 Join us for a Sunday funday full of tacos, connection, and communitaaaay, led by Eayikes camper turned grown young man - Ricky Cadena! Ricky has been working on his own taco cart concept and wishes to share his passion with us. The event will feature activities and discussions on food and how we each relate to this basic human necessity. Come support a young man’s grassroots business project and enjoy time with the community. $10 includes all the deliciousness! Paypal, Venmo, or cash. “What role does your multicultural identity play in your life? In this workshop, we aim to discuss multi-generational trauma, learn-as-you-go parenting, con-fusion identities, and the processes and microaggressions we all juggle to feel American. Donate what you can, all are welcome. RSVP below! Kyle and Alex have been DJing together for 10 years. 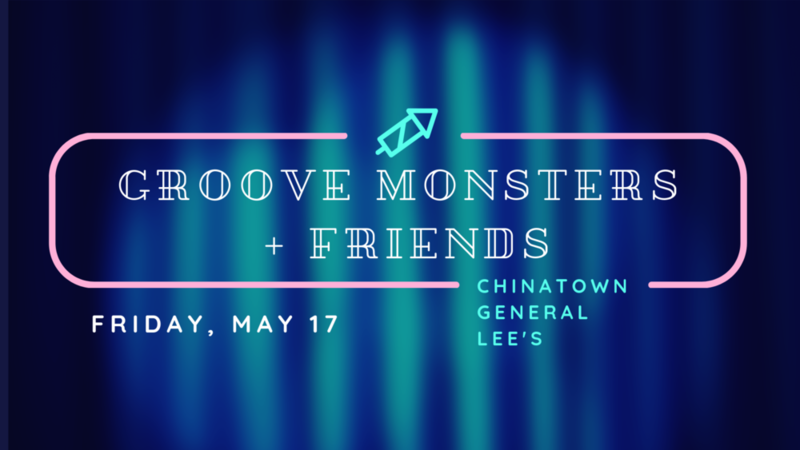 They go by the Groove Monsters and use DJing as a means to bring people together. Did you know Eayikes’ seed funding started from a year of monthly parties at a local bar in Orange County? For Alex’s birthday, they’re getting everyone together in Chinatown for a night of dancing and connecting! Donate what you can, all are welcome. Have you ever wondered what it would be like to go back to summer camp, but as a grown up? "Awe Yeaaah!" is just that! It's a 3-day 2-night camping trip for adults that's filled to the brim with community building, fun + creative workshops, and activating your childlike wonder. It's time to put your phone away, make friends you haven't met yet, and laugh and learn like you haven't in years! More information to come. RSVP below! “This screening is meant to shine light on the shadows of shame and misogyny. This movie highlights the way patriarchal society's punish Muslim women who don’t act in ways they are expected to. Through three varied characters, this movie illustrates the pain and struggle of being a Muslim woman, but weaves in a silver lining of courage, resilience, and the power of bearing witness. ‘Sexism is the ideology that supports patriarchal social relations, but misogyny enforces it when there’s a threat of that system going away,’ Professor Kate Manne of Cornell explains. Jamaican Independence Day is a free festival happening in Skid Row. We’ll be volunteering and enjoying music, food, and community. Save the date! Interested in volunteering? Sign-up below! We are so excited to be heading back to the orphanage with Speaking From The Heart! Check out the video above to learn about our first trip. *UPDATE* This service event is full, thanks everybody for your interest. Stay tuned for the next one! And we’re back with our first Wonderfull Wednesday of 2019. To celebrate Women’s History Month, our March workshop is dedicated to the theme of “honoring our female role models”. Bring an open heart, a friend, and a favorite snack to share! Cost: Donate what you can, all are welcome. Come have a Jam Sesh with us while we listen to and discuss music! At this brunch we will break bread, and make friends while discussing how music shapes and connects us. The first theme will be Forever Young; we will be talking about music we heard and discovered in our childhood. There will be some food provided, but of course if you would want to bring food/drink the more the merrier! Donate what you can, all are welcome! Participating and walking in solidarity with the Skid Row movement has helped us expand what it means to be of service; to be more than a service provider - to strive for equity and equality in our exchanges with communities outside of our comfort zone. OG Manuel Compito and his tribe have been mentoring us, compassionately guiding us through art, service event partnerships, and parables like Stone Stoup. In his decades of service to South Los Angeles communities, OG is paying forward his experiences and knowledge through books, documentaries, and in-person exchanges. We feel so fortunate to have met him on this journey and for the many lessons standing with Skid Row community teaches us. We invite you to build relationship with the beautiful human beings in the community by joining us for this celebratory event! Check out the Facebook Event to learn more. RSVP below! Thanks to the generosity of the Marciano Art Foundation, we’ve reserved 24 free tickets! Join us for a day of inspiration and community. In celebration of us, our cultures, and Black History Month, we are helping community members Mary and Esther with a 4-part series called Let’s Get Talking! Come and connect over an international potluck as we discuss various topics like ethnic family dynamics, minorities in the workplace, cultural contributions to the United States, and more! No expertise necessary, just you being you. Danny of Skid Row Coffee has renovated his family's convenience store, which exists in the heart of SKid Row on 5th and San Pedro, and transformed it into "a small grocery store with focus on real food and community building". As a major hub for the local houseless community, Skid Row People's Market will be one of a very few establishments that provide fresh vegetables and fruits. Join us this Sunday in blessing this market and its people! Rain or shine! Ponchos and umbrellas will be provided. For more details visit the Facebook event here. Our last workshop of the year! Think Wonderfull Wednesday centered around 2019 resolutions…on a Thursday! This is a free event. Please bring a snack to share. RSVP below! Each year of Eayikes continues to get better and better. Learnings on learnings and growth on growth! 2018 was no exception, so we want to celebrate the communitaaaay with an end-of-year gala. It’s a Sunday evening full of food, games, and community! Join us as we recap this wonderfull year and raise funds for our community partner Skid Row Coffee. $40 includes dinner, drinks & games. Food graciously provided by our friends at rctngl. 100% of proceeds benefit Skid Row Coffee. Skid Row Coffee is a community-based social enterprise. We organize around the intersections of land, food, and labor to build political and economic power in Skid Row. Skid Row Coffee Cafe is located in the Los Angeles Public Library—Central Library, a “crossroad” where many different people and communities come together. The cafe celebrates the humxn right to food that’s accessible, affordable and nourishing to all people. We work to create dignified jobs with fair wages, access to safe and equitable cultural spaces, and reclaiming food in Skid Row. Think Wonderfull Wednesday, but a holiday version centered around gratitude… on a Thursday! We all have abundance in our lives, let’s get together and celebrate life. Back in March we partnered with Araceli of Speaking From The Heart to play and wonder with children in Mexico. It was eye-opening traveling to our southern neighbors, and in an effort to build bridges we're headed back to the same orphanage! RSVP below. $40 includes transportation, donations are welcome, passports required. Shoutout to the Culture Shock LA family for creating a donation drive for the kids!! The annual Festival for All Skid Row Artists has become one of the most anticipated grassroots cultural events in the area. Los Angeles Poverty Department celebrates and preserves the rich artistic heritage of Skid Row. The Festival encourages known neighborhood artists and identifies and brings together arts makers who are unknown even in their own Skid Row neighborhood. LAPD collects information about the artists, documents their work and has kept a registry of Skid Row artists, which now numbers more than 700. We’ll be volunteering our time and spreading the love at this 9th annual event! RSVP below. Bring your own spirits, snacks, and wonder! RSVP below. We’re back at Chesapeayikes for another Wednesday refresher! Please bring a snack to share. RSVP below, this is a free event! The gracious folks at Hostelling International want to host us again to bring together LA locals and travelers! 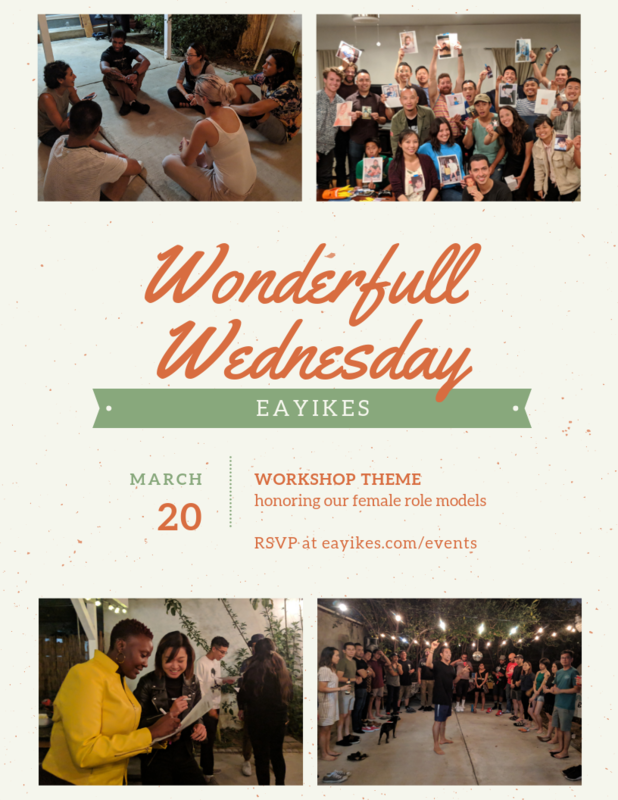 Come share the Eayikes love and help build some bridges as we expand the Wonderfull Wednesday vibe on a Thursday. 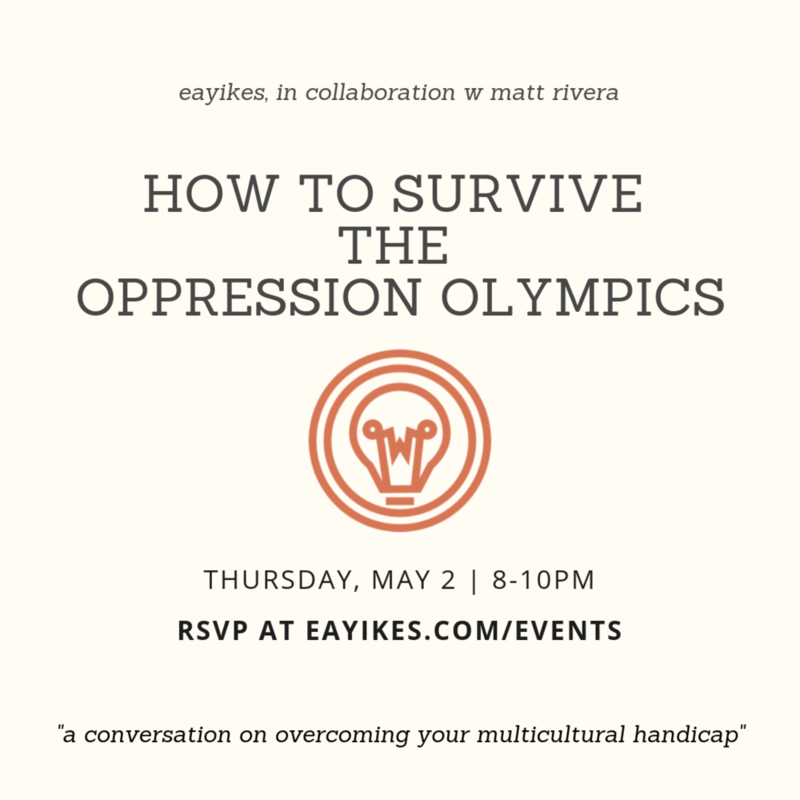 RSVP below, this is a free event! This month we have a special edition of WW in collaboration with Hostel International Santa Monica! They are graciously hosting us and we're sharing our love to world travelers. Please bring a snack to share, this is a free event! We're back with another refreshing Wonderfull Wednesday! Last week we focused on the idea of compassion. This week the topic is courage. Bring a snack to share, this is a free event! The Skid Row History Museum and Archive is hosting a free director's screening of Passing Through - a documentary on folks within the Skid Row community. The screening will include a Q&A with the director and featured leader, Manuel Compito. Leslie Dektor, a 2-time winner and 13-time nominee of the DGA Director of the Year Award, was inspired to embark upon PASSING THROUGH in part due to the research he'd been doing for a film on the Great Depression. Dektor saw parallels between the subjects in those photos and the poor and dispossessed in Los Angeles while also recognizing the power of art to bring light and hope to the darkest times. This film focuses on an art studio that was initially launched in Los Angeles’s Skid Row that, for years, offered the disenfranchised an opportunity to discover their creative voice and the dispossessed a sense of belonging. For decades, the poor and marginalized have been herded and confined to Skid Row but many found refuge, comfort and even a path to a new life there. Manuel Compito aka OG Man is a Homeless Advocate and Community Organizer, an author and highly skilled and gifted Fine Artist. He is a husband, father and grandfather. He has been featured in several documentaries including “Lost Angels,” “Humble Beauty,” and “Passing Through” as well as numerous other documentaries available on YouTube which feature his works. Manuel learned to draw as a child from his brother. He would later spend a considerable amount of time cultivating his talents during a lengthy period of incarceration. Even today, Manuel’s artwork derives from sketches based on his visual life experiences. Art serves as the nexus of his ideas, projects, programs and writings. “Art is my passion. Being of Service is my calling. Skid Row is ‘Ground Zero’ when it comes to community organizing. It’s the right place and the right time for those who want to make a difference.” says Manuel Compito. This mindset has been the motivating force which led to Manuel’s creation of the award-winning Skid Row 3on3 Streetball League, grass-roots organizations such OG’s N Service Association, Skid Row Brigade, Operation Facelift-SkidRow, Skid Row Artist Collective aka Hidden Treasures and “Peace- N-Hood,” a neo-novel and coloring book for the urban area. Often referred to as “The God Father of Skid Row,” Manuel Compiito has allowed his passion for art and his dedication to “being of service, ” to cumulate in a magnificent way, consequentially impacting the lives of many. He is a mentor, a brother, a friend, and an inspiration to the Skid Row community and beyond. Improv, public speaking, goal-setting... an evening of connection and growth! This is a free event. We're headed to Little Tokyo to support community partner, Culture Shock Los Angeles, and their annual urban dance benefit show! RED is a family-friendly hip hop production that explores social issues and themes of empowerment through dance. Come with us and get a group rate, contact us by 6/29! We're writing comfort letters and shipping stuffed animals for children separated at the border. Come on by and let's put our heads together to see if there's even more we can do. If you can't make it, we're accepting donations for writing materials, stuffed animals, and shipping. Thank you! Spikeball, vitamin D, and "cowabunga-dudes"! Join us for a day of fun in the sun at Ocean View Park. This is a free event! Part 1 of our Summer Serie-yikes. This is a free event, bring a dish and an open heart! For more info RSVP! Celebrating Alex Yoon's birthday! Movie & a discussion with the one and only, highly-acclaimed, Willie Witte. Premiered at Communitaaaay Campout 2017, we are re-screening a new director's cut of Eternity. This is a free event!